“Healthy Lifestyle doesn’t have an expiry date. If you want to enjoy living in your dream body then you gotta work for it. You can’t get it you have to earn it”. These are not my golden words, Moomal’s inspirational words i am quoting here 🙂 When i first met her through her page and came to know about her and her efforts of motivating girls (of all ages) i was simply inspired and asked her to give me some time for interview. She is so sweet and humble girl.I am taking you to her journey of losing weight. Q 1. Moomal tell us something about you. Who is Moomal in person? I’m an optimist, even-tempered and Foodie Hedonist. 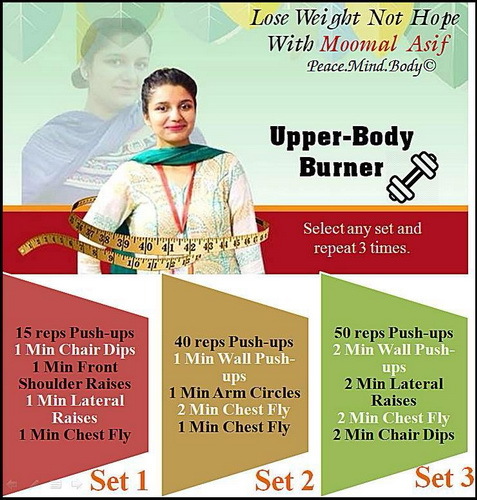 Besides this I’m a Language Instructor, Weight Loss Enthusiast and Motivational Speaker.My aim is to fade away the fear of being FAT & empower women from upper & lower strata of society in oder to uplift the art of feminism. Q2. How did the Peace.Mind.Body© collaboration comes out 🙂 What was your idea behind this? 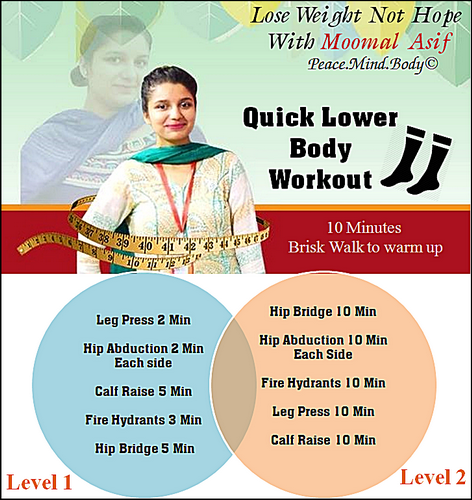 As the name defines it pretty well Peace.Mind.Body© is all about a pleasant place for women where things can be discussed related to Weight Loss or Weight Maintainance, Fitness and Beauty. This group was formed in order to give the right channel to the people who get easily fooled by FAD DIETS-JUICING. It’s a place which is free from all the disturbances and tranquil. Peace.Mind.Body© is a group which costs nothing, it’s free for all the women around the world. Q3. People like me are so much confused about nutrition and diet. Is there such as one thing that works for everyone. People get scared when they hear the word “DIET”; for them dieting means starvation. Everyone is on diet!!! 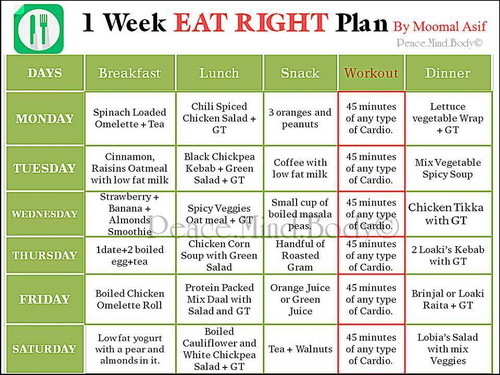 now have a look whether they are on healthy diet or unhealthy diet.“The more you eat the more you lose” that’s my strategy which I promote. 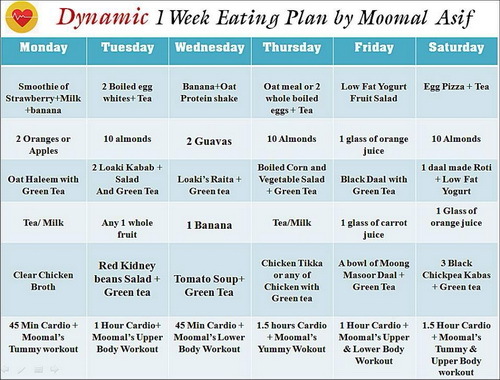 Instead of eating 3 large meals if you eat 5 small meals through out the day you will see amazing changes on your scale. Q4. How long has it been since you were last on a diet? It has been more than 2 years that I’m on a diet but Hang on!!!! I’m on a healthy diet. I eat everything in a controlled portion and somehow if I have to eat unhealthy I burn it off by exercising twice in a day. I eat brown rice, brown pastas, fresh juices all in finite. Q5. Do you think the battle of the bulge is so important? You can’t get a perfect body which is finely shaped; You have to EARN it. That means if you want to lose that bulge around your belly, you have to work hard. The rule is simple, Eat Healthy and exercise regularly for 20 minutes. If you want to lose weight; do Intense Cardio for an hour in a day along with healthy diet unlike JUICING or totally NO CARB diet. Q6.Can your briefly clarify for everyone the role of carbohydrates in our diet? Do we need to fear them? Visualize yourself as you want to be, slimmer and healthier. Dieting doesn’t have to mean deprivation when you focus on what you really want. 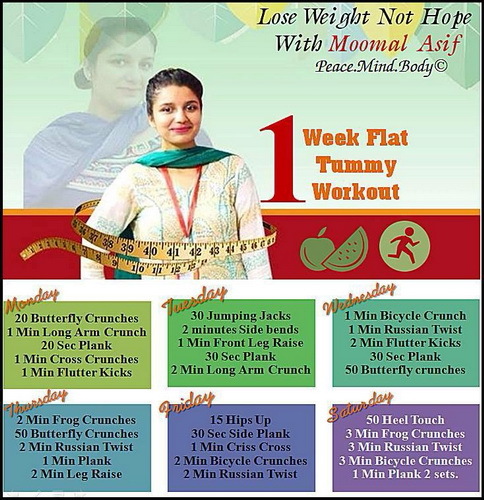 Work out beside healthy eating is essential , here are few workout plans of Moomal. If you want 2016 the best year of your life, tension free, weight loss trauma free then come on! 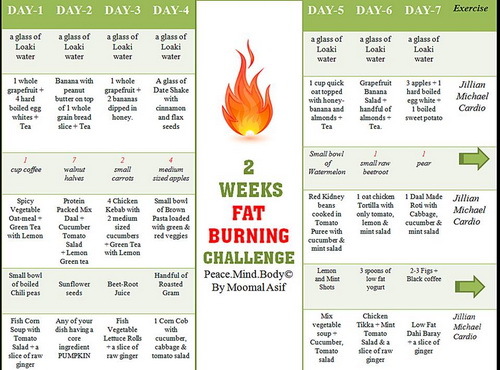 Get ready to burn that extra bulge and enjoy your life at the fullest. 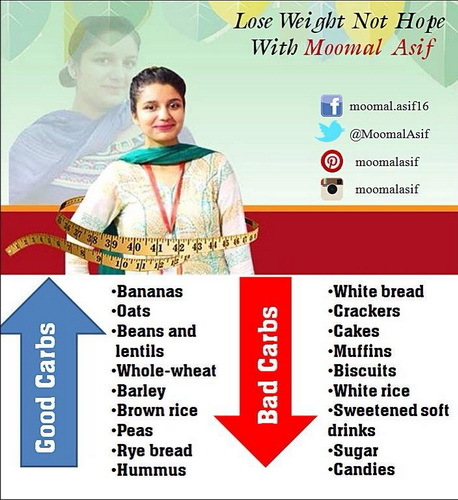 Do share with your friends and family who are over weight and drag them too; towards the healthy life which is unlike FAD DIETS/JUICING- MOOMAL ASIF. I am grateful to you Moomal for giving us knowledge and time ,stay blessed. 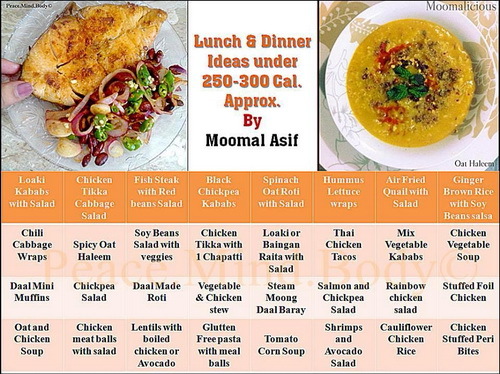 Her group and page links are given you can visit her page and ask about diet plans from Moomal. 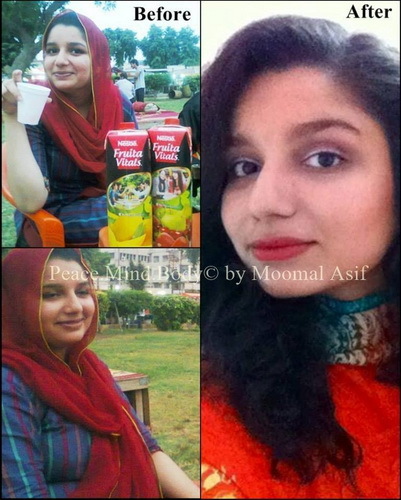 I am not running Momal Asif Group, She will approve herself. Might be busy so wait for few more days. Hi. Last three days back I send request on fb but u didn’t accept the request.This is very disappointing. Dear Maryam, I am not Momal Asif, I am Ainy. She will add you as soon as she will be free. 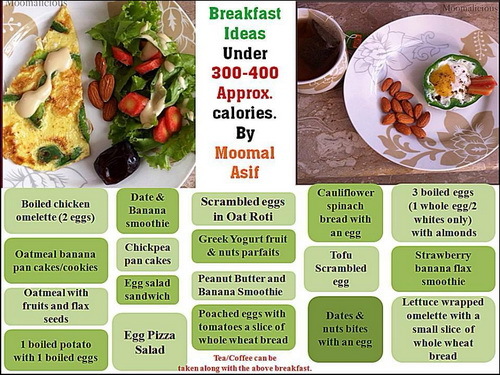 Slam Kiya weight loss Karne wale blue band margrine breakfast me use karsakte is se nuksan to nh hoga ? Instead of Margarine you can use Peanut butter. I will not recommend any margarine.